Eagle Analytical Services has served our customers since 2004. We can work with you on any issue you may encounter. 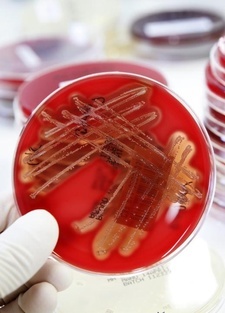 We offer the highest quality in preparation testing for sterility, bacterial endotoxins, microbial detection, beyond-use dating (BUD) determination and active ingredient potency. Our state-of-the-art equipment, combined with the experience and knowledge of our team, makes Eagle Analytical Services the best choice for all your testing needs. At Eagle, we are committed not only to performing the best quality control testing, we work relentlessly with you on solutions if your test receives unexpected results. With Eagle as part of your team, confidence will soar. Eagle Analytical Services is registered with the FDA, the DEA and the Texas Department of Public Safety, allowing us to offer a wide range of testing capability. 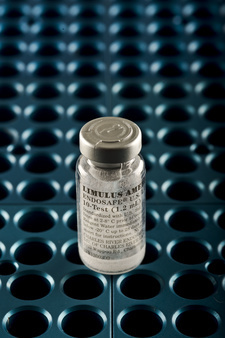 Our raison d'être is to serve the compounding pharmacist, and we do it with expertise, enthusiasm and devotion. Animal Treat, Aqueous Solution, Capsule, Cream, Foam, Food Supplement, Gel, Gelatin, Inhalant, Injectable, Lollipop, Oil, Ointment, Paste, Pellet, Powder, Suppository, Suspension, Tablet, Triturate and Troche. Eagle Analytical Services has been granted ISO/IEC 17025 accreditation by the International Organization for Standardization (ISO) and the International Electrotechnical Commission (IEC.) The accreditation is the single most important standard for calibration and testing laboratories around the world. Laboratories that are accredited to this international standard have demonstrated that they are technically competent and able to produce precise and accurate test and/or calibration data. Accreditation is a voluntary, third-party reviewed process in which a laboratory�s quality-management system is thoroughly evaluated on a regular basis to ensure continued technical competence and compliance with ISO/IEC 17025. Eagle Analytical Services ISO/IEC accreditation is for 11 specific tests that are conducted on compounded pharmaceutical products, including the state-of-the-art Rapid Scan RDI® Microbial Detection Test, which uses fluorescent labeling and laser scanning technologies to detect bacteria, mold, yeast and fungi more rapidly than any other method. 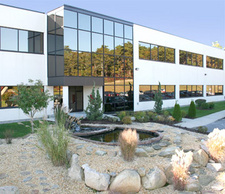 Analytical Research Laboratories (ARL), a division of ARL Biopharma, has been serving the pharmaceutical and health-related industries since 1994. With over 100 years of combined experience in the industry, ARL can meet and exceed your analytical needs. We offer a full range of professional laboratory services, both analytical and microbiological, as well as consulting services, research and development and forensic legal support. ARL�s professional staff can respond to even the most unusual requests. We use state-of-the-art instrumentation, and provide rapid turnaround time and personal service. Contact us for additional information or a detailed quote. Analytical Research Laboratories (ARL) offers complete analytical services utilizing state-of-the-art instrumentation, including Gas Chromatography (GC), Liquid Chromatography (LC) and Mass Spectrometry (MS). ARL also provides compendial testing according to USP/NF, BP, EP, JP, and ACS monographs. 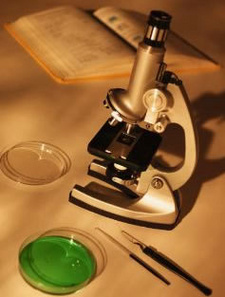 In addition to our analytical testing capabilities ARL has a microbiology department for sterility, fungal, endotoxin testing, cell culture tests, bacterial and fungal identification, and preservative effectiveness testing. ARL is registered with the Food and Drug Administration (FDA) as an analytical laboratory and the Drug Enforcement Administration (DEA). Analytical Research Laboratories operates in compliance with the Good Laboratory Practice (GLP) and Current Good Manufacturing Practice (cGMP) requirements. There are many services ARL can provide to be a full service laboratory or to compliment your current in-house laboratory to meet your outsourcing needs. As a forensic toxicologist, Dr. Kupiec has provided consultation and expert witness testimony in the field of forensic toxicology and pharmaceutical sciences. He has testified in over 100 cases in municipal, state and federal courts, involving both civil and criminal issues. ARL works with clients daily, utilizing cutting edge technology to develop products ranging from pharmaceuticals, medical devices and over-the-counter products to take to market. These services range from consultation contract to providing full laboratory services and outsource services for pharmaceutical companies. The parent company of Analytical Research Laboratories, ARL Biopharma, also holds the renowned DNA testing company DNA Solutions. DNA Solutions is leading the trend in looking to the future of medical treatments including pharmacogenomics and gene therapy. By having the capability to provide analytical testing services as well as the DNA testing and sequencing services the possibilities are limitless with ARL Biopharma. Critical Timelines and Stringent Regulations Are No Match for Charles River Microbial Solutions. Maintain control and consistency in your compounding processes. 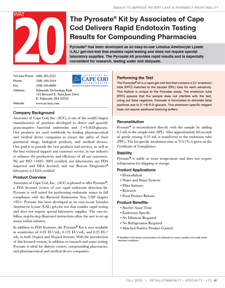 With compounding pharmacy regulations under scrutiny, compliance has never been more important. Maintain control and consistency in your compounding procedures with solutions from Charles River. 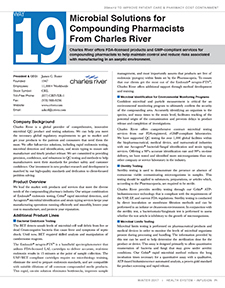 Offering unmatched regulatory expertise and a portfolio of FDA-licensed products and GMP-compliant services, Charles River is the trusted partner who can help you align your operations with current regulatory standards. Required by regulatory bodies for compounding pharmacies, the Bacterial Endotoxins Test (BET) detects unsafe levels of microbial cell wall debris, from live or dead Gram-negative bacteria, that cause fever or septic shock. Unfortunately, traditional BET methods can be costly, requiring skilled analysts and manipulation of cumbersome reagents. The Endosafe® nexgen-PTS� is a more efficient way to conduct this critical testing. The convenience of the handheld spectrophotometer simplifies endotoxin testing to deliver real-time, point-of-sample quantitative endotoxin results in just 15 minutes. 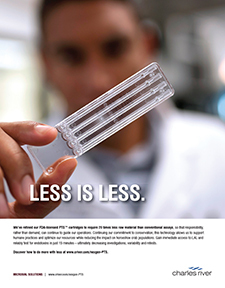 All necessary LAL reagents are condensed into a single disposable cartridge for easy operation and assurance that your products are free of endotoxin within limits set by the United States Pharmacopeia (USP). 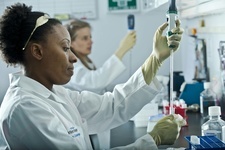 Our Endosafe® nexgen-PTS� endotoxin testing systems provide faster results for improved process efficiency and ease-of-use over traditional methods, while offering additional benefits of portability, improved accuracy, and reproducibility. The LAL cartridges used with the system are licensed by the FDA for in-process and final product release testing of parenterals, such as compounded sterile products (CSPs). The nexgen-PTS� is fully compatible with USP chapters <85> Bacterial Endotoxins Test and <797> Sterile Compounding, and is the optimum solution for bacterial endotoxins testing of compounded drugs due to its simplicity and speed. 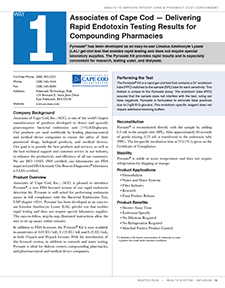 Confident microbial and particle measurement is critical for your environmental monitoring program to ultimately confirm the security of your compounding area. Accurately identifying an organism to the species, and many times, to the strain level, facilitates tracking of the potential origin of the contamination and prevents delays in product release and completion of investigations. Charles River offers comprehensive contract microbial testing services from our FDA-registered, cGMP-compliant laboratories. 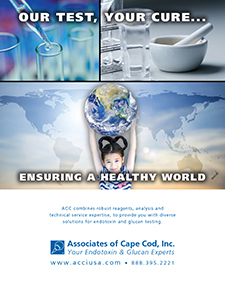 We have supported QC testing for over 1,000 global facilities with our cost-effective microbial identification and strain typing services using our proprietary Accugenix® database, which profiles more relevant microorganisms than any other reference library in the industry. Offering a 98% accurate identification rate and 99% on-time delivery, we have tested and identified more microorganisms than any other company or service laboratory in the industry. Whether faced with critical timelines or stringent regulations, you can rely on Charles River to ensure the safe manufacture and timely release of your product. 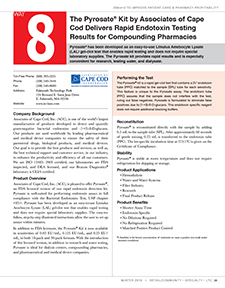 Pyrosate has been developed as an easy-to-use Limulus Amebocyte Lysate (LAL) gel-clot test that enables rapid testing and does not require special laboratory supplies. The Pyrosate Kit provides rapid results and is especially convenient for research, testing water, and dialysate. 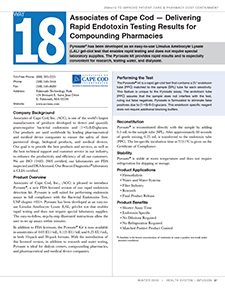 Charles River offers FDA-licensed products and GMP-compliant services for compounding pharmacists to help maintain control and reduce risks associated with manufacturing in an aseptic environment. Pyrosate ® has been developed as an easy-to-use Limulus Amebocyte Lysate (LAL) gel-clot test that enables rapid testing and does not require special laboratory supplies. The Pyrosate kit provides rapid results and is especially convenient for research, testing water, and dialysate. We provide solutions to your big problems by identifying the small ones. 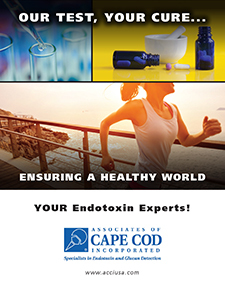 Associates of Cape Cod, Inc., (ACC) is pleased to introduce a new, FDA licensed version of our rapid endotoxin detection kit, Pyrosate®. 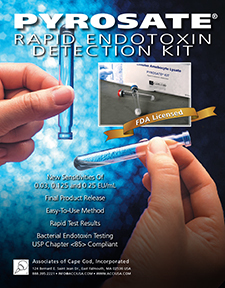 Pyrosate® is well suited for performing endotoxin assays in full compliance with the Bacterial Endotoxins Test, USP chapter <85>. Pyrosate® has been developed as an easy-to-use Limulus Amebocyte Lysate (LAL) gel-clot test that enables rapid testing and does not require special laboratory supplies. 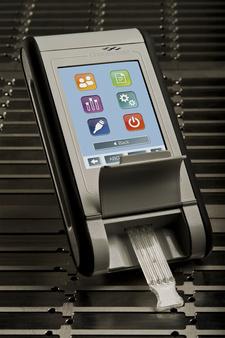 The easy to follow, step-by-step illustrated instructions allow the user to set up assays within minutes. 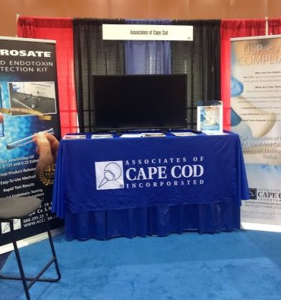 Associates of Cape Cod, Inc., (ACC) is pleased to introduce a new, FDA licensed version of our rapid endotoxin detection kit, Pyrosate®. Pyrosate® is well suited for performing endotoxin assays in full compliance with the Bacterial Endotoxins Test, USP chapter <85>.